After a damp start, Lewis Hamilton perfects his strategy and his pace to clinch his first win of the 2017 season, but it was Max Verstappen's charge that stole the show. Lewis Hamilton bounced back from his defeat to Sebastian Vettel in the Formula 1 season-opener in Australia two weeks ago by controlling Sunday's Chinese Grand Prix en route to his fifth win in Shanghai. Hamilton managed to perfect both his strategy and his pace to take Mercedes' first win of the year, with Vettel recovering from an early pit stop to finish second, leaving the pair tied on points heading to Bahrain next weekend. 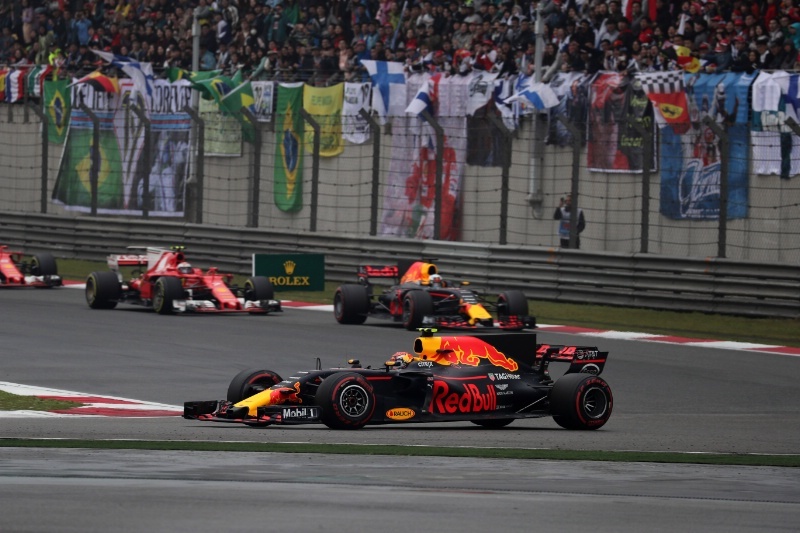 However, it was Max Verstappen who stole the show in Shanghai, charging from P16 on the grid to finish third after a remarkable early charge reminiscent of his fight through the field in Brazil last year. With rain easing in the lead-up to lights out, drivers were left considering fitting slick tyres for the start. Most opted to play it safe and stick with intermediates, with Carlos Sainz Jr. the only driver to roll the dice, only for the gamble to initially backfire as he dropped to the back of the field on the first lap. Up front, Lewis Hamilton was able to retain his lead on the first lap as Sebastian Vettel fought hard to keep Valtteri Bottas back. Vettel was placed under investigation by the stewards for appearing to start the race out of position, sitting towards one side of his grid slot, but was soon cleared of gaining an advantage. The race was quickly placed under the Virtual Safety Car when Lance Stroll was clouted by Sergio Perez, putting the Williams driver out of the race. A number of drivers took advantage of this to make the switch to slicks, including Vettel, but Hamilton opted to stay out on intermediates along with the lead five drivers, one of whom was Max Verstappen, who had made a sensational charge in the opening stages from 16th on the grid. The VSC ended, only to be quickly replaced by a full safety car following a big shunt for Sauber's Antonio Giovinazzi on the main straight. This allowed the leading drivers who had stayed on intermediates to take a free stop, with Hamilton retaining his lead and moving on to the soft tyre. Daniel Ricciardo rose up to second for Red Bull ahead of Kimi Raikkonen and Verstappen. Vettel - whose early stop had proved costly - now found himself in sixth, while Bottas had fallen to P12 after spinning behind the safety car. Verstappen's charge continued at the expense of Raikkonen upon the restart, with the Dutchman also diving down the inside of team-mate Ricciardo a couple of laps later to lift himself up to second. Ricciardo was left to dice with the chasing Ferraris, with Verstappen soon lapping around one second per lap faster as he set off in pursuit of Hamilton. As the leading duo pulled away, Australia winner Vettel was growing increasingly frustrated down in fifth. 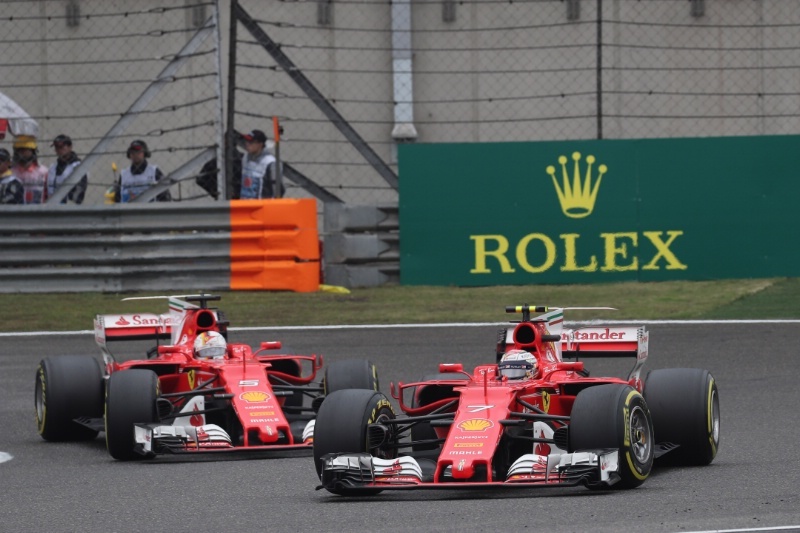 A power issue meant that Raikkonen was struggling to get close to Ricciardo in third, backing his Ferrari teammate up in the process. Growing tired of being held back, Vettel produced a fine overtake at Turn 6 to slip past Raikkonen and take fourth before latching onto the back of Ricciardo ahead. Unlike his team-mate, Vettel was able to make light work of Ricciardo, sweeping around the outside at Turn 6 with a superb overtake, and was quickly able to start carving into Verstappen's advantage in second. Unable to keep his super-soft tyres alive, Verstappen soon found himself under pressure from Vettel for position, but failed to make the Ferrari driver's life difficult. A lock-up at the hairpin sent Verstappen wide, allowing Vettel to swan through to second place. Red Bull brought Verstappen in one lap later for a fresh set of super-softs, leaving him down in sixth behind the recovering Bottas. Verstappen wasted little time in lighting up the timesheets on his new tyres, going almost two seconds faster than Hamilton at the front. All of the soft runners had planned to go to the end of the race without pitting again, but Verstappen was causing a headache on the pit wall. Another dive-bomb move at Turn 6 saw the Red Bull man pass for P5, which soon became P4 when Ricciardo mirrored his teammate's strategy. Ferrari and Mercedes knew there was little option but to follow suit. Vettel came in at the end of Lap 34, taking on a set of softs and coming out three seconds clear of Verstappen, with Hamilton blinking two laps later. Mercedes was able to swiftly service the Briton's car and bring him out still in the lead, with Raikkonen running P2 as Ferrari tried to roll the dice on his strategy and keep going. After a heated argument with his engineers on the pit wall, Raikkonen eventually convinced Ferrari to bring him in for a second stop, allowing Vettel to move up to second and Verstappen onto the podium. Vettel upped his pace in the closing stages to try and scare Hamilton into a mistake, but the world champion was unfazed. A flurry of quick lap times allowed the Briton to pull the gap back out to over eight seconds, with the lead lasting until the chequered flag. The result marked Hamilton's fifth win in China, and drew him level with second-placed Vettel at the top of the drivers' championship. Verstappen managed to fend off the charging Ricciardo on the final lap to take third place for Red Bull, having lost chunks of time in the closing stages. Ricciardo was left to settle for P4, with Raikkonen following just two seconds behind in fifth. Valtteri Bottas recovered to sixth place for Mercedes, finishing ahead of Sainz, who took a well-deserved seventh after his early stop for Toro Rosso. Kevin Magnussen scored his first points as a Haas driver in eighth, with the Force India pair of Sergio Perez and Esteban Ocon rounding out the points.